The growth of population is causing the demand for freshwater to increase at an alarming rate. Demand in such areas can quickly expand to exceed water supply if necessary strategies are not implemented. An approach that is quickly gaining acceptance is considering municipal wastewater as a vital resource for appropriate application including agricultural and other irrigation, industrial and domestic uses. This practice is called water reclamation and reuse and is an example of an Environmentally Sound Technology because it protects the environment, results in less pollution, utilizes resources in a more sustainable manner, allows its waste and products to be recycled, and handles residual wastes in a more acceptable manner than the technologies for which it substitutes. Water reclamation is the treatment or processing of wastewater to make it reusable with definable treatment reliability and meeting appropriate water quality criteria; water reuse is the use of treated wastewater for a beneficial purpose. The term, reclaimed water, is used interchangeably with an often more acceptable term recycled water. Wastewater treatment schemes have multiple levels of treatment that ensure water discharged to the environment doesn’t pose a significant risk to the health. Treated wastewater is usually discharged to surface water and that surface water is often used by a water source for a water utility downstream. Hence, many systems use wastewater inadvertently. Thus, many water systems reuse wastewater inadvertently. Water reclamation and reuse approaches utilize the same treatment technologies as conventional wastewater treatment, including secondary clarifiers, filtration basins of various designs, membranes, and disinfection basins. Each and every water reclamation treatment scheme requires some degree of customization; a great deal of work is done to define appropriate applications for wastewater treatment processes. There are many barriers that often limit the implementation of water reclamation and reuse systems. Physical issues such as corrosion of pipes, blockage etc. can hinder the transportation of reclaimed water. Technical barriers can hinder successful implementation of water reclamation and reuse programs as well. Implementation of reclamation and reuse programs often requires the retrofitting and construction of new systems as well as the development of new technologies This can lead to high costs that effectively limit the implementation of these programs. Reusing rainwater or gray water on-site can have significant financial and environmental benefits. It is highly important to leave it to the experts to design and implement these processes. Panorama has decades of experience in water reclamation systems. A Process Flow Diagram (PFD) demonstrates the relations between significant segments in a framework. PFD likewise arrange process configuration esteems for parts in various working modes, commonplace least, ordinary and greatest. A PFD does not demonstrate minor segments, funneling frameworks, channeling appraisals and assignments. They use a series of symbols and notations to depict a process. The symbols vary in different places, and the diagrams may range from simple, hand-drawn scrawls or sticky notes to professional-looking diagrams with expandable detail, produced with software. To document a process for better understanding, quality control and training of employees. To standardize a process for optimal efficiency and repeatability. To study a process for efficiency and improvement. It helps to show unnecessary steps, bottlenecks and other inefficiencies. To model a better process or create a brand-new process. To communicate and collaborate with diagrams that speak to various roles in the organization or outside of it. Major equipment: Including names and ID numbers. Examples include compressors, mixers, vessels, pumps, boilers and coolers. Process piping: Moves the product, usually fluids, between equipment pieces. Operational data: Such as pressure, temperature, density, mass flow rate and mass-energy balance. Values often will include minimum, normal and maximum. The process flow diagram is an essential part of chemical engineering. It conveys a process and the path of its individual components – therefore, it is essential to learn how to read and create one. The information that a process flow diagram conveys can be categorized into one of the following three groups. The more detailed these three sections are, the easier it is for a user of the process flow diagram to follow along and understand. Process topology is characterized as the collaborations and areas of the distinctive hardware and streams. It incorporates the greater part of the associations between the hardware and how one stream is changed to another after it moves through a bit of gear. Streams should be labeled so that they follow consecutively from left to right of the layout so that it is easier to follow along and locate numbers when you are trying to locate streams listed on the tables. Notwithstanding the stream data, there ought to likewise be a table specifying gear data. This table can be useful for the practical investigation of the plant since it ought to give the data important to assess the cost of the gear. The gear data table ought to incorporate a rundown of the greater part of the hardware that is utilized as a part of that specific stream graph alongside a depiction of size, stature, number of plate, weight, temperature, materials of development, warm obligation, region and other basic data. The demand for freshly made food is increasing on the rise. This demand has led to the development of methods that use minimal preservatives and additives. The use of lesser preservatives lead to decreased shelf life of food and makes them more susceptible to contaminants. Product contamination occurs not only at the equipment level but also at factory level. Incorporation of hygienic design into your food processing facility can prevent development of pests and microbiological niches; avoid product contamination with chemicals e.g., cleaning agents, lubricants, peeling paint, etc. and particles e.g., glass, dust, iron, etc. ; facilitate cleaning and sanitation and preserve hygienic conditions both during and after maintenance. The infrastructure of a facility must be designed in a manner to avoid contamination of food products. To ensure safe food and adequate sanitation programs, the facility and surroundings in which foodprocessing and handling operations are conductedmust be designed and constructed with sanitarydesign principles in mind. The layout of a food facility must be adapted to the hygienic requirements of a given procedure, packaging or storage area. The interior of the manufacturing plant must be outlined with the goal that the stream of material, work force, air and waste can precedein the right way. As they end up consolidated into sustenance items, crude materials and fixings should move from the dirty to the ‘clean’areas. However, the flow of food waste and discarded outer packaging materials should be in the opposite direction. Before building begins, reproduction of the stream of individuals, materials, items and waste can enable the originator to decide the most fitting spot for introducing the procedure gear and where the procedure and utility funneling ought to enter the procedure region.Indeed, even the recreation of support and cleaning tasks can be helpful to decide the most fitting production line design. 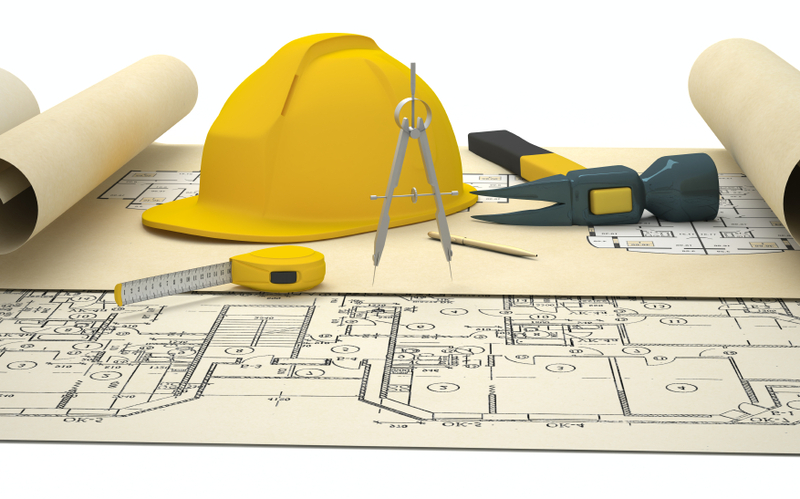 To spare building and redesign costs, potential issues can be understood before the beginning of development. Moreover, in the advancement of high cleanliness territories, computational liquid elements can help recreate and envision expected airflows. To meet a conceivable increment of handling activities inside the sustenance plant later on, the building and its nourishment preparing emotionally supportive networks ought to be outlined so they can either be extended, or another building or potentially utilities can be included. Oversizing the primary utility frameworks is a typical practice. On the off chance that conceivable, the processing plant ought to likewise be made versatile (i.e., the capacity to change the generation zone for other assembling purposes) and flexible (i.e., the capacity to do distinctive things inside a similar room). To exclude flooding and the section of rodents, industrial facilities should be worked at a larger amount than the ground outside. Outside entryways shouldnot open specifically into generation zones, and windows should be missing from nourishment preparing regions. The quantity of stacking docks should not be negligible and be 1– 1.2 m over the ground level. Ideally, outside docks ought to have an overhanging lip, with smooth and uncluttered surfaces that are inclined somewhat far from the working to energize water run-off. Regions underneath docks ought not give harborages to bugs, ought to be cleared and should deplete enough. To give security to items and crude materials, docks can be protected from the components by rooftops or coverings. Be that as it may, these structures can turn into a genuine sanitation issue because of perching or settling of flying creatures. Winged creature spikes or nets can take care of that issue. To keep the section of creepy crawlies, dock openings ought to be given plastic strips or air drapes, and outer lighting to enlighten these industrial facility doors ought to be put in areas from the manufacturing plant building. Meddling bugs can in any case be pulled in and slaughtered inside the sustenance processing plant by deliberately situated bright (UV) light electric lattices or sticky pasteboard traps. Many food manufacturers only make use of the classic food preservation approach to control food safety. Clean sustenance industrial facility configuration begins with the choice of a fitting area and the utilization of a sterile building idea that keeps the passage of irritations. The industrial facility format must allow the right stream of materials, waste, air and staff without trading off nourishment wellbeing and in addition the establishment of clean zones that offer maximal assurance to the sustenance created. Process hardware and process and utility channeling must be composed from nourishment review materials that are perfect with the sustenance item delivered and the cleaning specialists and disinfectants connected to purify the generation condition. To stay away from the presentation of new contaminants, gear and funneling must be cleanly coordinated inside the production line’s premises. Dividers, roofs and floors must have a fitting complete the process of, lighting must give adequate enlightenment and channels should ensure legitimate seepage to encourage clean-ing and to keep up sterile conditions inside the plant. The point of this article is to fill in as a prologue to legitimate clean sustenance office plan. The operation of the CIP system requires the control of several conditions, i.e., the fluid flow rates and velocities, temperatures, cleaning times and the concentrations of the cleaning chemicals (detergents, caustic soda). Systems in the pharmaceutical and bio-pharmaceutical industries use higher velocities for process piping. In the case of tanks, the rates of flow of either water or cleaning solution are largely determined by the size of the tank, as well as the number and the properties of the spray devices. These gadgets arrive in an assortment of plans. The customary spray ball is generally used and gives directional streams of water or cleaning arrangement from little, static spouts. Rotational gadgets give round shower designs and direct impingement spray devices present high-weight streams at low streams, turning through 360˚ The impingement spray gadgets speak to a contrasting option to the expulsion of soils or stores by falling water or cleaning arrangement that course dmown the sidewalls of the tanks or vessels. The temperature of the CIP procedure may fluctuate from 135 to 175˚F and control is normally critical. The essential heat transfer requests are met either by joining heat exchangers into the CIP framework, or by direct infusion of steam. Chemicals might be added using peristaltic, pneumatic stomach and additionally more exact metering pumps. Groupings of the cleaning solutions are observed and controlled by the estimation of the pH or electrical conductivity of the solution. The CIP procedure includes an arrangement of cycles that incorporates an underlying and last deplete step, a pre-flush, wash and post-flush. The span of the flush and wash cycles fluctuate from 5 minutes to 60 minutes. In the pharmaceutical, bio-pharmaceutical, dairy and food industries, the CIP procedure may incorporate a purify cycle to lessen the levels of bacterial contamination. This cycle essentially utilizes watery arrangements of solid oxidants, for example, hydrogen peroxide, ozone, chlorine dioxide and other chlorine-containing compounds. At the point when a sanitize cycle is incorporated, thorough last flush cycles are required to maintain a strategic distance from erosion of the stainless steel tanks, vessels and process funneling, because of the nearness of hints of the solid oxidant, especially the chlorine containing mixes or chloride ions. To efficiently drain process equipment and process piping, the system design must allow the fluids to flow out. Avoid sections of the piping and equipment in which fluid flow is restricted. Split flow designs also adversely affect the flow of solution through a piping system. Any problem areas should be identified and the piping modified or an appropriate cleaning method developed. The pre-rinse uses recycled water to flush out loosely adhering particulates and soil. This water is often flows directly to the drains as it leaves the CIP system. Depending on the nature of fouling and deposits, the number of chemicals for the wash cycle is used. The post-rinse cycle provides the final flush for the system. The effluent from this cycle is then discharged to the drains and directed to a tank. The effluent may flow to the drain or recovery points under gravity, but some CIP systems include return pumps or eductor devices. To improve product quality in manufacturing systems, Clean-in-place (CIP) technology offers significant advantages. Right from efficient and reliable cleaning of process equipment and piping to lower costs, they have much to offer. The controls provide variety of cycle times, temperatures, composition and concentration of cleaning solutions. In order to reduce costs and control waste disposal these systems include current recycling and regeneration technologies. The automatic, reproducible and reliable delivery of cleaning solutions improves both product quality and plant hygiene. The ability to clean a processing system, incorporating tanks, pumps, valves, filters, heat exchange units and process piping, significantly reduces cleaning costs. It also helps minimize the handling of chemicals to provide a safer environment for plant personnel. CIP systems must be included in the design of any new process system. CIP systems have several designs. The “single-pass” and the “recirculating” configurations are often utilized in the processing industries, since both require minimal capital investment. They usually have a small footprint and are flexible, in that the unit can readily adjust to a range of cleaning protocols. However, the cost for the chemicals, water and steam and for disposal of the wastewater are higher than for other designs. The food industry usually favors a ‘re-use design’ that provides recycling of the water and regeneration of the cleaning chemicals. These systems have a larger footprint and are at greater risk of cross-contamination. It also lacks flexibility i.e. a single temperature and single concentration of cleaning solution is used for the whole process system. The pharmaceutical and bio-pharmaceutical industries prefer to use a multi-tank configuration. 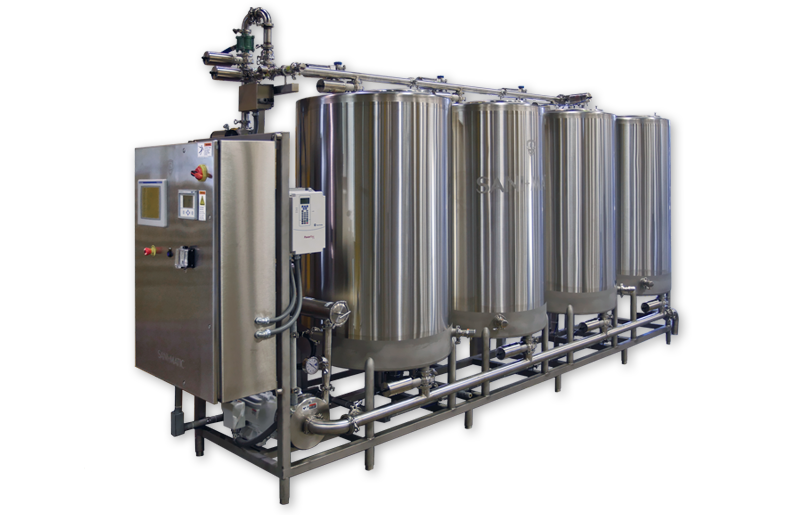 They have independent, stainless steel tanks that hold water of different quality, e.g., deionized water (DI), hot or cold water for injection (WFI) and water from reverse osmosis units (RO). These multi-tank systems are operated as if they were single-use systems, the tanks being drained between subsequent programs to minimize cross-contamination. This system is capable of circulating small volumes of water at relatively high rates. A single use unit developed for the use in dairy and food processing industries has recently found application in selected pharmaceutical industries. These systems reduce the consumption of water and chemicals. Rupture disc, also known as bursting disc/pressure safety disc/burst disc is a pressure relieving device used in Chemical, Pharmaceutical, Aerospace, Aviation, Defence, Railroad, Nuclear, Food Processing, Petrochemical industries. The main purpose of the disc is to release excess pressure and prevent any structural/functional damage to the instruments/machines. A Rupture disc is fitted inside the pressure pipes/instruments & is designed to rupture/burst/tear at a pre-defined pressure. It can be calibrated for a pre-determined pressure (positive) or vacuum conditions. When the disc is designed for vacuum conditions, the atmospheric pressure would push this disc into the system. Hence, a support device is used to prevent the atmospheric pressure from pushing the disc into the system. Thus, when the pressure rises, the disc ruptures and releases excess pressure thereby protecting the system from damage. One of the biggest limitations of a rupture disc is that once burst, the entire system has to be shut down to replace the disc. The downtime on shutting down the entire system and then rebooting it can cost some heavy losses in price sensitive & highly competitive markets. To overcome this disadvantage, designers were sent back to the drawing board for designing an improvised version of the rupture disc. A relief valve serves the same purpose as the rupture disc but has the added advantage of not shutting down the system. The inlet is threaded and connected to the system. The outlet is threaded and connected to the exhausts. The system is embedded with a spring which controls the release of pressure. The Rupture Disc was implemented by PANORAMA ENGINEERS at VERTEX PHARMACEUTICALS. To help ensure safe and healthful workplaces, OSHA has issued the Process Safety Management of Highly Hazardous Chemicals standard, which contains requirements for the management of hazards associated with processes using highly hazardous chemicals. 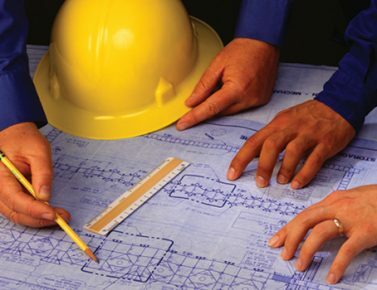 Process safety management (PSM) is addressed in specific standards for the general and construction industries. OSHA’s standard emphasizes the management of hazards associated with highly hazardous chemicals and establishes a comprehensive management program that integrates technologies, procedures, and management practices. OSHA has been busy when it comes to monitoring facilities with highly hazardous chemicals (HHCs). Since 2010, OSHA has issued more than 69 enforcement cases regarding Process Safety Management (PSM). The problem is, many organizations don’t understand OSHA’s PSM standard or realize if it even applies to them. Why Did OSHA Develop PSM? In 1991, to help ensure safe and healthy workplaces, OSHA issued the Process Safety Management of Highly Hazardous Chemicals standard (29 CFR 1910.119). This rule contains requirements of the management of hazards associated with processes using HHCs. Additionally, in January 2017, OSHA issued a new National Emphasis Program to further protect workers’ health and safety in certain industries that pose high risks to people and the environment. To help minimize toxic occurrences, PSM was created. PSM aims to prevent the release of toxic, reactic, flammable, and explosive chemicals into the environment. OSHA states that the PSM standard applies to “a process that involves a chemical at or above the specified threshold quantities (TQs) listed in Appendix A of the standard. The Appendix contains a list of toxic and reactive HHCs, which present a potential for a catastrophic event at or above the TQ. When evaluating chemicals on the list, it’s important to look at the TQ as well as checking and verifying the chemical abstract service number (CAS). This involves the entire chemical inventory, making an appropriate chemical inventory process crutial. One important interpretation to note is that OSHA uses the phrase “on site in one location” in the standard to mean that the standard applies when a TQ of a HHC exists within an area under the control of an employer or group of affiliated employers. It also applies to any group of vessels that are interconnected or in separate vessels that are close enough in proximity that the HHC could be involved in during a potential catastrophic release. • A TQ of flammable liquids is stored in atmospheric tanks or transferred without the benefit of chilling or refrigeration. • Hydrocarbon fuels are used solely for workplace consumption as a fuel (e.g. propane used for comfort heating or gasoline for vehicle refueling). • Fuels are not a part of a process containing another HHC covered by this standard. Considering the severity of the consequences that HHCs pose to the environment and the past disasters that have occurred, we only see PSM continuing to become a stronger and stronger regulation. Design Safety arose in the 1950s after dissatisfaction with the fly-fix-fly approach to safety. Design Safety was first adopted by the US Air Force. It led to the development of mil-std-882 Standard Practice for System Safety (v1 1960s). The basic concept of System was rather than assigning a safety engineer to demonstrate that a design is safe, safety considerations were to be integrated from the design phase of the project. Inherent: belonging to the very nature of the person/thing (inseparable). It is recommended that Inherent safe design should be the first step in safety engineering. Change the process to eliminate hazards, rather than accepting the hazards and developing add-on features to control them, unlike engineered features, inherent safety cannot be compromised. Factors of safety (FoS), also known as safety factor (SF), is a term describing the load carrying capacity of a system beyond the expected or actual loads. Essentially, the factor of safety is how much stronger the system is than it usually needs to be for an intended load. Safety factors are often calculated using detailed analysis because comprehensive testing is impractical on many projects, such as bridges and buildings, but the structure’s ability to carry load must be determined to a reasonable accuracy. When the material used is under strength, factor of safety covers uncertainties in material strength. It covers poor workmanship. It also covers unexpected behavior of the structure and natural disasters. Stresses are produced which may be very high. Factor of safety may take care of these loads during construction. Presence of residual stresses and stress concentrations beyond the level theoretically expected. Safety barriers are arranged in chains. The aim is to make each barrier independent of its predecessors so that if the first fails, then the second is still intact, etc. Typically, the first barriers are measures to prevent an accident, after which follow barriers that limit the consequences of an accident, and, finally, rescue services as the last resort. The basic idea behind multiple barriers is that even if the first barrier is well constructed, it may fail, due to unforeseen reason, and that the second barrier should then provide protection. The major problem in the construction of safety barriers is how to make them as independent of each other as possible. If two or more barriers are sensitive to the same type of impact, then one and the same destructive force can get rid of all of them in one swoop. These three principles of engineering safety – inherent safety, safety factors, and multiple barriers are quite different in nature, but they have one important trait in common. They all aim at protecting us not only against risks that can be assigned meaningful probability estimates, but also against dangers that cannot be probabilized, such as the possibility that some unforeseen even triggers a hazard that is seemingly under control. It remains, however, to investigate more in detail the principles underlying safety engineering and, not least, to clarify how they relate to other principles of engineering design. Waste minimization is a practice or process through which the quantity of generated waste is reduced with the main objective of producing the least of unwanted by-products through the optimal use of raw materials, water and energy which in turn reduces the amount of waste entering the environment. 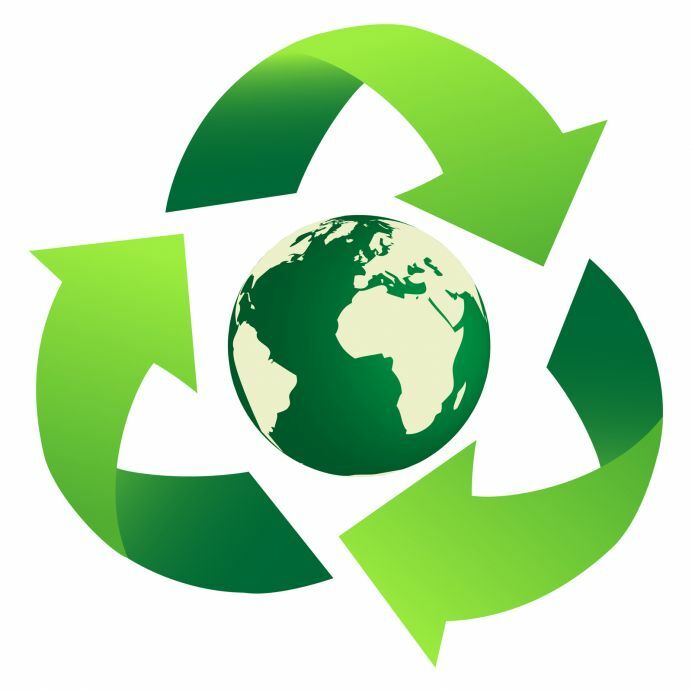 It supports any company’s aim for a “Clean technology” production which means full utilization of resources, cost savings in storage, treatment & disposal of generated waste by reducing its volume and its strength or concentration, improves environmental compliance, ensures profit, and promote corporate good image. For any company which is competing in today’s world, efficient and “clean” processes have become a necessity which not only involves maximization of all the resources and utilities, but also the minimization of waste products. This results in a more cost effective production and plant operation. This activity of waste minimization can be classified under Corporate Social Responsibility Activities and thus, greatly help in boosting a company’s reputation in the society due to which it should be one of the prime focal points for any company’s top management. The process of waste management in a company can be initiated through the formation of a team/committee consisting of people within the company who are solely dedicated to reduction of waste management within the company. This team then conducts various audits to track the amount of waste being generated through various operations and accordingly comes up with a detailed plan to minimize it. This includes reduction in effluent production, cutting down costs by conservation of water & energy and even resource optimization to minimize wastage. These plans, once approved by the top management of the company, are communicated throughout the company and are encouraged to implement them for minimum waste generation. The progress in tracked through keeping a tab on the amount of waste being generated and comparing pre-implementation and post implementation waste generation and required improvements are made in the plan. This creates an efficient feedback loop for progress tracking and also helps with the enforcement of the plan. Ever since the Kyoto Protocol has been put into effect and widely accepted by countries all over the world, the organizations within these countries have become more vigilant about the emissions as well as managing the waste generated which in turn has led to a greater shift in focus for these organizations towards their CSR initiatives and has amplified the need of Waste Management tremendously. Distillation is used to separate components in a feed mixture based upon their relative boiling points. A simple, continuous distillation column can make the separation between two components into two product streams. In multi-component systems, the two main components to be separated are designated as the light and heavy keys. The light key is the more volatile component in greater purity in the top product stream, and the heavy key is the less volatile component in greater purity in the bottom product stream. The starting point upon which all column design is based is to accurately determine the relative volatility of the key components to be separated. Using a mass and energy balance simulation program. The user must set up the basis of the simulation by selecting an appropriate fluid package and the components present in the feed. Activity coefficients, estimated by the program or provided by the user, are used to relate non-ideal component interactions. The first step in column design is specifying the column operating objectives. These are defined by a primary product composition and an optimal recovery of the product from the waste, recycle or less important by-product stream. These specifications should be in terms of the heavy key impurity in the top stream and the light key impurity in the bottom stream. Once the top and bottom stream compositions are specified, the dew point of the top stream and the boiling point of the bottom stream may be determined at various pressures. An operating pressure should be selected that allows acceptable temperature differences between available utilities because the overhead vapor must be condensed and the bottom liquid reboiled. When possible, atmospheric or pressure operation of the column is preferred in order to avoid requiring a vacuum system. However, another consideration is component heat sensitivity, which may require lower pressure operation to avoid fouling, product discoloration or decomposition. Often the relative volatility is also improved at lower pressures. Using the simulation program, shortcut procedures based upon total reflux operation allow the minimum reflux ratio (R/Dmin) and minimum number of ideal separation stages (Nmin) to be determined. Using an actual reflux ratio of 1.2 times the minimum reflux ratio will allow an optimal number of stages to be estimated as well as an appropriate feed stage. Rigorous simulation of the distillation at a given feed rate and composition may now be accomplished by specifying the following: top and bottom product compositions, number of stages, feed stage, and top and bottom pressure. Parametric cases of this simulation should be used to verify the estimated number of stages and feed location. Add and subtract stages from both the stripping and rectifying section of the column. Do this until the required reflux ratio becomes approximately 1.2 times the minimum reflux ratio, or the trade off between utility usage and the number of stages appears optimal for the specific column. As more total stages are used, the required reboiler duty will decrease until there are diminishing returns. At this point, the distillation process is well defined, leaving the column diameter and height to be determined. The chosen design case from the simulation program provides the internal liquid and vapor flows and their physical properties for every stage of the column. The column diameter is chosen to provide an acceptable superficial vapor velocity, or “Fs factor”. This is defined as vapor velocity (ft/sec) times square root of vapor density (lb/ft3), and liquid loading defined as volumetric flow rate (gal/min), divided by the cross sectional area of the column (ft2). The column internals can be chosen as either trays or packing. Trayed columns must avoid flooding, weeping and downcomer backup. Packed columns must avoid flooding, minimum surface wetting and mal-distribution. Project managers should understand and determine these five key design elements for the projects success. Cost, chemical interactions and equipment needs change in a non-linear fashion, as increased output is required. 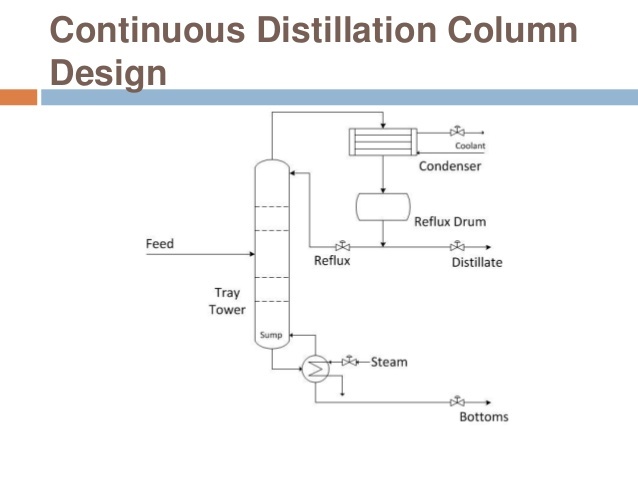 Qualified engineers should consider these critical steps for distillation column design.